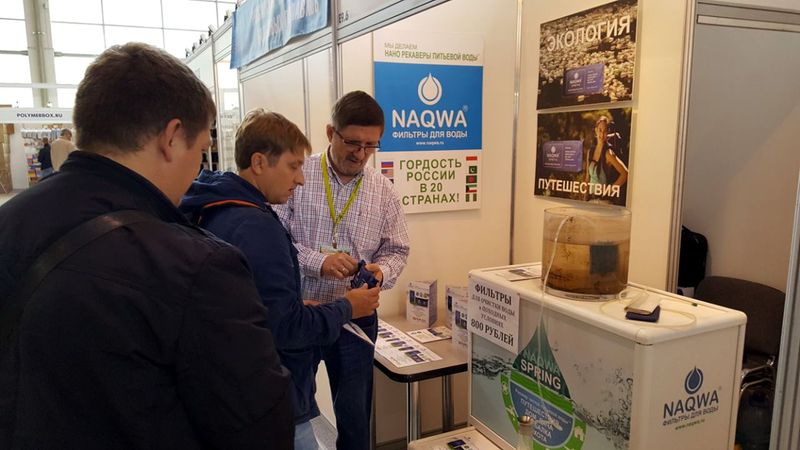 NAQWA at "Hunting & Fishing in Russia-2017"
NAQWA presented its portable Drinking Water Recoverers NAQWA SWR at the annual international exhibition "Hunting & Fishing in Russia-2017" which traditionally took place in Moscow, 14-17 September this year. Manufacturers and trading companies both from Russia and abroad ( China, South Korea and other) took part in the event. It is worth mentioning that NAQWA SWR water filters were the only product of such type presented at the exhibition and as usual it raised a lot of interest both from the guests of the event and its participants. As a result NAQWA plans to sign new agency and distributorship agreements with our partners operating both in Russia and abroad in China, India and Turkey as well as in other countries. NAQWA water filters delivered to Syria by Russian Humanitarian Mission. Portable NAQWA Spring water recoverers for getting drinking water out of superficial sources.